If you are interested in chiropractic or are a new patient please look at the following short videos to glean a better understanding of how chiropractic can benefit you and your family. 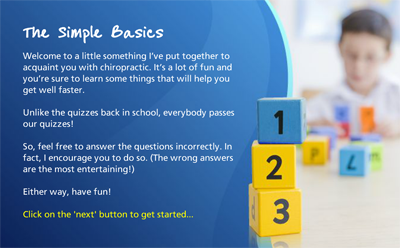 Here is a six-part, interactive quiz style e-Learning curriculum that will help you learn more about your chiropractic care. They only take a minute or 2 each to complete and are fun. We really encourage you to take the time to do them to get the most out of your care with us. 1. The Simple Basics Click to Try! 2. 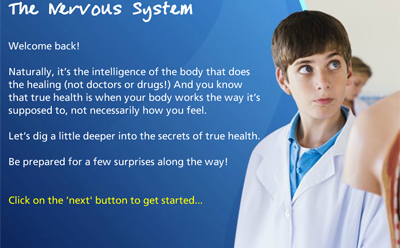 The Nervous System Click to Try! 3. 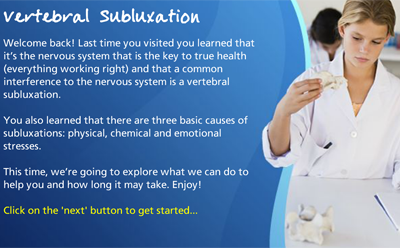 Vertebral Subluxation Click to Try! 4. 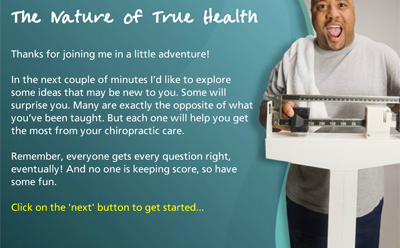 The Nature of True Health Click to Try! 5. 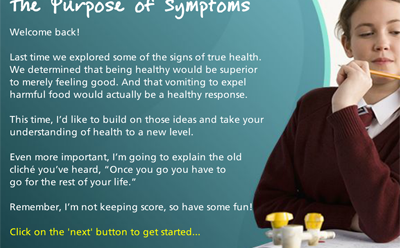 The Purpose of Symptoms Click to Try! 6. The Chiropractic Difference Click to Try!